You can't fault it for features. HP's Officejet Pro 8500 lets you fax or email documents directly from the printer, offers Duplex printing and can be connected to a network via Ethernet. The model here is wireless, enables Duplex scanning and has a 3.5-inch colour touchscreen. HP has improved the paper feeder, with pages now pulled from the centre instead of the sides for fewer jams. You can add a second feeder tray if you wish. The 8500 boasts a 20% smaller footprint compared to predecessors, and measured against colour all-in-one laser printers, we're promised it's 50% cheaper to run and uses half the energy. HP says its Officejet range isn't that ideal for photo printing, but the 8500 performed okay. It lacks the vibrancy of a dedicated photo printer and doesn't handle solid colours so well, but text printing is solid and clear, even at very low point sizes. Our 20-page test document printed in one minute, 46 seconds using Preview's standard settings, which is excellent. It photocopies with clarity, though loses it a little on very tight parallel lines. Setting up a wireless connection is simple. 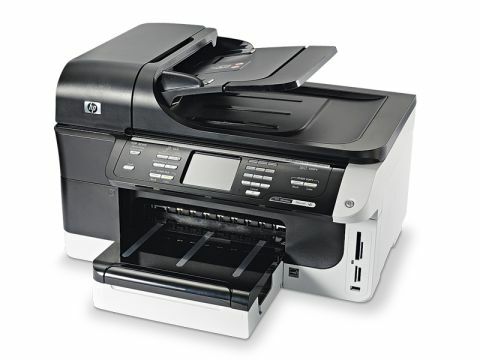 HP Officejet Pro 8500 is a good all-rounder that's packed with features. If you do a lot of photo printing it isn't for you, but for the home or small office it's ideal. At £300 it doesn't come cheap, so make sure you need all those features.